BANKING mergers in this country have always been difficult to put together and have had their fair share of controversies. The most recent merger — between Hong Leong Bank and EON Bank — was completed in 2011 and had many twists and turns. It eventually ended up in court before finally being inked after 17 months. The merger had dragged on for so long because one significant shareholder of EON Bank objected to it and went to court to fight its case but lost. The current CIMB-RHB-MBSB merger proposal is also in a sticky situation because a significant shareholder of RHB Capital — Abu Dhabi-based Aabar Investments PJS — has indicated that it will not accept any deal if its asking price is not met. Almost three months since the announcement, the dynamics are getting more complex and intriguing. While negotiators from all three parties are beavering away to come up with a concrete structure (the biggest hurdle is always pricing), the outcome will very much depend on Bursa Malaysia’s decision on whether the Employees Provident Fund (EPF) can vote. Industry observers even say that if the EPF is not allowed to vote, there is really little point in coming up with a deal because the outcome is a foregone conclusion: RHBCap’s 21.2% shareholder Aabar Investments will not vote yes unless it is paid RM11.80 a share and, apparently, it must be a cash deal. And the indications so far are that neither of the other parties involved — the EPF and CIMB — is willing to value RHBCap at RM11.80 apiece. 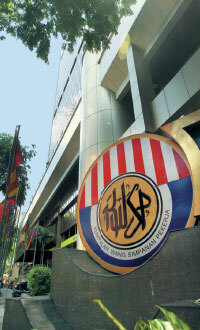 Bursa Malaysia meets on Oct 9 to decide whether or not the EPF can vote. Under the exchange’s listing rules, the EPF cannot vote because it is deemed a related party as it holds stakes in all three financial institutions. Bursa, however, has the power to grant an exemption. Coincidentally or by design, the Bursa meeting is taking place one day after the end of the 90-day exclusivity period for the three parties to come up with a deal. The talk now is that Bank Negara Malaysia will grant an extension. The Bursa decision, whatever it is, will be a landmark one. Pressure is already mounting, the latest being a letter sent by Abu Dhabi’s Deputy Prime Minister Sheikh Mansor Zayed al Nahyan to Putrajaya protesting against letting the EPF vote. Bursa is indeed caught between a rock and a hard place. If it allows the EPF a waiver so that it can vote, there are concerns that it could set a precedent for the future with others in a similar situation also asking for, and expecting to be given, an exemption. Yet, the EPF is unlike the typical substantial shareholders of companies. It is unique because it is a pension fund for all Malaysian workers and it does hold more than 5% equity interest in over 100 companies listed on the local stock exchange because the Malaysian capital market lacks the depth and breadth for the pension fund to have a more diversified portfolio. Inevitably, at any point in time, the EPF will be involved in related-party transactions. Is it fair, therefore, to deny it the right to vote to protect its own interest? As a major shareholder, and given its unique position, shouldn’t the pension fund have a say in a corporate exercise of this magnitude? So, what can be done to overcome this sticky situation? Perhaps, one way out is for the EPF to be allowed to vote, but with a condition that it set up three separate investment committees, each of which will independently decide whether the merger is in the interest of CIMB, RHB and MBSB respectively. This will remove any conflict that could arise if the existing investment committee of the EPF is to decide on how it will vote at all three entities. The main EPF investment panel must abide by whatever decision is made by each of the three independent committees, even if it means voting against the merger. There must be transparency and governance. That is at the EPF level. As for pressure from Abu Dhabi, it cannot be stressed enough that Bursa’s decision on Oct 9 should not in any way be influenced by it. The decision must be based on what is right for the EPF, its members as well as the minority shareholders of all three financial institutions. It should not succumb to the demands of Abu Dhabi or even Putrajaya. Indeed, Putrajaya should not give in to the threat from Abu Dhabi that it will pull out investments from Malaysia. Past experiences have shown how volatile and unreliable foreign direct investment flows from the Middle East are, such as in Iskandar Malaysia where all the promised billions in investments never materialised. One can even question how much of Abu Dhabi’s investments in Malaysia has really translated into money spent on projects. Some of the promised projects involving investments from Abu Dhabi include the Tun Razak Exchange and Bandar Malaysia, a joint venture with 1Malaysia Development Bhd, and the development of a RM21 billion strategic petroleum reserve facility in Johor. Until now, these are all still words. Not a single sen has been spent. Abu Dhabi has said it wants RM11.80 to RM12 or it’s no deal, one of its arguments being that it had acquired its stake in RHBCap in 2011 at RM10.80 a share. It must be noted, however, that the figure was a related-party valuation as Aabar had bought its stake from Abu Dhabi Commercial Bank, and that it was higher than RHB’s market price at the time. Abu Dhabi Commercial Bank had acquired the shares at RM7.20 each in 2008. The RM11.80 to RM12 a share price is said to have been arrived at after taking into account Aabar’s holding cost, including interest payments and foreign exchange losses. RHBCap’s share price, however, has not breached the RM10 level since 2008. The highest it has risen is RM9.98 on June 3, 2011. Any investor knows that all investments involve risk and that returns are not guaranteed. Of course, Aabar Investments can include its holding cost in the equation when coming up with the price at which it is willing to sell, but at the end of the day, the right price should be determined by the market. And in any case, the EPF cannot take out Aabar alone at RM12 because the same price must be offered to all other shareholders of RHBCap.